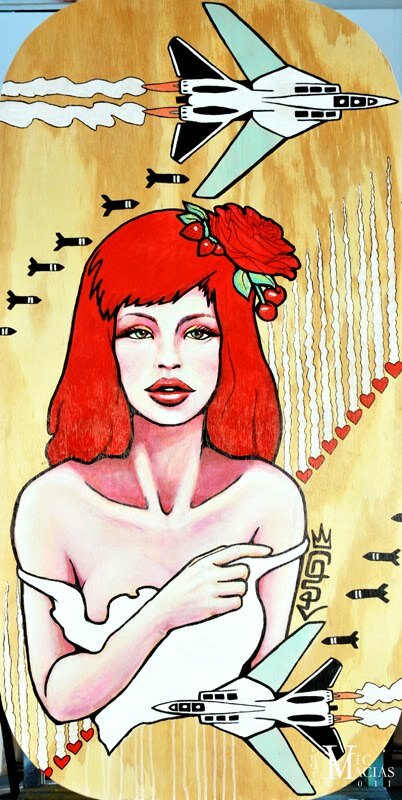 This piece is entitled “Bombs Away” and is by the artist Kazilla who has “an instant love affair with all natural highs and all things to do with art and expression”. In her piece she shows just that and this is her poetic explanation: In a post-apocalyptic world, we live in fear and despair. The only way to combat the end of days is with the pure love in our hearts. The days pass by like grains of sand through my fingertips. There is no music, no laughter or songs. There are only the drops of bombs, like rainfall in the early morning. The earth shakes and my body quakes. 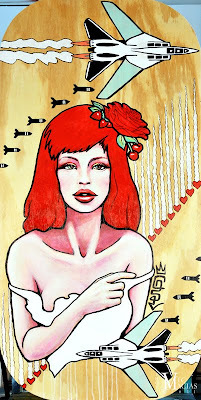 I push out the hate that disintegrates all life and drop my own cherry bombs of love on these ignorant warmongers. Every bomb that drops and levels miles of city, land and lives, I plant a seed of life. Every bullet they shoot my way, I blow a kiss at them. They throw hand grenades, I hold their hands. In the warm embrace of death, I simply embrace them with pure affection.